Wyatt Berry Stapp Earp (March 19, 1848 – January 13, 1929) was an American farmer, teamster, sometime buffalo hunter, officer of the law in various Western frontier towns, gambler, saloon-keeper, and miner. He is best known for his participation in the Gunfight at the O.K. Corral, along with Doc Holliday, and two of his brothers, Virgil Earp and Morgan Earp. Wyatt Earp is the major subject of various movies, TV shows, biographies and works of fiction. Earp's iconic status as a law enforcer serves as a corrective over-and-against the way in which such outlaws as Jesse and Frank James and Billy the Kid emerged as heroes in the popular mind during the same period. For some—the rich and powerful and those who made and enforced the law—were a privileged elite who prevented the poor from earning a decent wage. Thus, in a society based on law and order that claimed to be class-free, even outlaws could emerge as heroes (even if they were merely criminals, not social activists). Yet everyone knew that the law had to be respected, or no one would be secure, so lawmen such as Earp gained iconic status to counter that of the outlaws against whom they pitted themselves. Yet their reputations depended on that of the outlaws. On July 30, 1840, widower Nicholas Porter Earp, a stern and opinionated man, wed local girl Virginia Ann Cooksey in Hartford, Kentucky. This second marriage for Nicholas produced eight children. Wyatt Earp was born in Monmouth, Illinois, on March 19, 1848. Wyatt Earp had an older half-brother, as well as a half-sister, who died at the age of ten-months. Nicholas Earp named his fourth son after his commanding officer during the Mexican-American War, Captain Wyatt Berry Stapp of the Illinois Mounted Volunteers. In March 1850, the Earps left Monmouth for California but settled instead in Iowa. Their new farm consisted of 160 acres, seven miles northeast of Pella, Iowa. On March 4, 1856, Nicholas sold his Iowa farm and returned to Monmouth, Illinois, but was unable to find work as a cooper or farmer, the work he knew best. Faced with the possibility of not being able to provide for his family, Nicholas chose to become a municipal constable, serving at this post for about three years. Reportedly, he had a second source of income from the selling of alcoholic beverages, which made him the target of the local Temperance movement. Subsequently, he was tried in 1859 for bootlegging, convicted for the crime and publicly humiliated. Nicholas was unable to pay his court-imposed fines, and, on November 11, 1859, the Earp family's property was sold at auction. Two days later, the Earps left again for Pella, Iowa. Following their move, Nicholas made frequent travels back to Monmouth throughout 1860 to confirm and conclude the sale of his properties and to face several lawsuits for debt and accusations of tax evasion. During the family's second stay in Pella, the Civil War broke out. Newton, James, and Virgil joined the Union Army on November 11, 1861. Only 13 years old at the outbreak of the war, Wyatt was too young to join but later tried on several occasions to run away and join the army, only to have his father find him and bring him home. While Nicholas, now a provost marshal, was busy recruiting and drilling local companies, Wyatt—with the help of his two younger brothers, Morgan and Warren—was left in charge of tending an eighty-acre crop of corn. James returned home in the summer of 1863 after being severely wounded in Fredericktown, Missouri. Newton and Virgil, however, fought several battles in the east and returned home at the end of the war. On May 12, 1864, the Earp family joined a wagon train heading to California. The 1931 book Wyatt Earp: Frontier Marshal by Stuart N. Lake, tells of the Earps' encounter with Indians near Fort Laramie and that Wyatt reportedly took the opportunity at their stop at Fort Bridger to hunt buffalo with Jim Bridger. Later researchers have suggested that Lake's account of Earp's early life is embellished, since there is little corroborating evidence for many of its stories. By late summer 1865, Wyatt and Virgil had found a common occupation as stagecoach drivers for Phineas Banning's Banning Stage Line in California's Imperial Valley. This is presumed to be the time Wyatt had his first taste of whiskey; he reportedly felt sick enough to abstain from it for the next two decades. In the spring of 1866, Earp became a teamster, transporting cargo for Chris Taylor. His assigned trail for 1866–1868 was from Wilmington, California, to Prescott, Arizona Territory. He also worked on the route from San Bernardino through Las Vegas, Nevada Territory, to Salt Lake City. In the spring of 1868, Earp was hired by Charles Chrisman to transport supplies for the construction of the Union Pacific Railroad. This is believed to be the time of his introduction to gambling and boxing; he refereed a fight between John Shanssey and Mike Donovan. Wyatt returned to Monmouth looking for his father, but soon was headed to Missouri because his father had relocated once again. Wyatt married his first wife, Urilla Sutherland, on January 10, 1870, in Lamar, Missouri. She died of typhus only a few months later. On February 11, 1870, Wyatt is said to have become constable of Lamar. For years, researchers had no reliable account of Earp's activities or whereabouts between the remainder of 1871 and October 28, 1874, when Earp made his reappearance in Wichita, Kansas. It has been suggested that he spent these years hunting buffalo (as is reported in the Stuart Lake biography) and wandering throughout the Great Plains. He later affirmed this statement himself. He is generally considered to have first met his close friend Bat Masterson around this period, on the Salt Fork of the Arkansas River. Nevertheless, the discovery of contemporary accounts that place Earp in Peoria, Illinois, and the surrounding area during 1872 have caused researchers to question these claims. Earp is listed in the city directory for Peoria during 1872 as living in the house of Jane Haspel, who operated a bagnio (brothel) from that location. In February 1872, Peoria police raided the Haspel bagnio, arresting four women and three men. The three men were Wyatt Earp, Morgan Earp, and George Randall. Wyatt and the others were charged with "Keeping and being found in a house of ill-fame." They were later fined 20 dollars and cost for the criminal infraction. Two additional arrests for Wyatt Earp for the same crime during 1872 in Peoria have also been found. Some researchers have concluded that the Peoria information indicates that Earp was intimately involved in the prostitution trade in the Peoria area throughout 1872. This new information has caused some researchers to question Earp's accounts of buffalo hunting in Kansas. In Frontier Marshal, Lake claimed that while in Kansas, Earp met such notable figures as Wild Bill Hickok. Lake also identified Earp as the man who arrested gunman Ben Thompson in Ellsworth, Kansas, on August 15, 1873. However, Lake failed to identify his sources for these allegations. Consequently, later researchers have expressed their doubt about Lake's account. Diligent search of the available records has uncovered no evidence that Wyatt Earp was in Ellsworth at the time of Thompson's trouble there. Proponents of Earp's arrest of Thompson, or even Earp's presence in Ellsworth in August of that year, point to unsubstantiated recollections that Earp registered at the Grand Central Hotel there. Research has shown Earp did not check into the hotel that summer. In particular, the activities of Benjamin Thompson during the year of his arrest were covered in detail by the local press without ever mentioning Earp. Thompson published his own accounts for the events in 1884, and he did not report Earp as the man responsible for his arrest. Deputy Ed Hogue of Ellsworth actually made the arrest. Like Ellsworth, Wichita was a train terminal which ended cattle drives from Texas. Such cattle boom towns on the frontier were raucous places filled with drunken, armed cowboys, celebrating at the end of long drives. Earp officially joined the Wichita marshal's office on April 21, 1875, after the election of Mike Meagher as city marshal (the term causes confusion, since "city marshal" was then a synonym for police chief, a term also in use). One newspaper report exists referring to Earp as "Officer Erp" (sic) prior to his official hiring, making his exact role as an officer during 1874 unclear. Probably he served in an unofficial paid role. Earp received several public acclamations while in Wichita. He recognized and arrested a wanted horse thief, W. W. Compton, (having to fire his weapon in warning but not hurting the man) and later a group of wagon thieves. He had a bit of public embarrassment in early 1876 when a loaded single action revolver dropped out of his holster while he was leaning back on a chair during a card game and discharged when the hammer hit the floor. The bullet went through his coat and out through the ceiling. 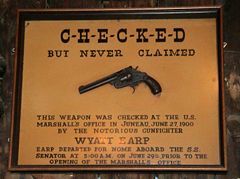 It may be presumed from Earp's discussion of the problem in Lake's pseudobiography Wyatt Earp: Frontier Marshal (published after Wyatt's death) that Wyatt never carried a single-action with six rounds again. In Lake's version, Earp did not admit that he had first-hand knowledge of this error. Wyatt also came under scrutiny for actions undertaken by his family members, including the fact that his sister-in-law, Bessie Earp, and second wife, Mattie, where arrested for prostitution. Earp also had his nerves tested in Wichita in a situation which was not reported by the newspapers but which occurs in the Lake biography, and is substantiated in the memoirs of his deputy Jimmy Cairns. Wyatt had angered drovers by acting to repossess an unpaid-for piano in a brothel and forcing the drovers to collect the money to keep the instrument in place. Later, a group of nearly 50 armed drovers gathered in Delano, preparing to "hoorah" Wichita across the river. ("Hoorah" was the Old West term for out-of-control drunken partying). Police and citizens in Wichita assembled to oppose the cowboys. 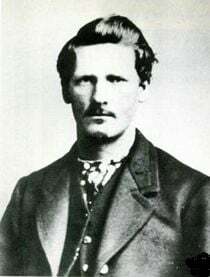 Earp stood in the center of the line of defenders on the bridge from Delano to Wichita and held off the mob of armed men, speaking for the town. Eventually, the cowboys turned and withdrew, peace having been kept without a shot fired or a man killed. Years later Cairns wrote of Earp: "Wyatt Earp was a wonderful officer. He was game to the last ditch and apparently afraid of nothing. The cowmen all respected him and seemed to recognize his superiority and authority at such times as he had to use it." In late 1875, the local paper (Wichita Beacon) carried this item: "On last Wednesday (December 8), policeman Earp found a stranger lying near the bridge in a drunken stupor. He took him to the 'cooler' and on searching him found in the neighborhood of $500 on his person. He was taken next morning, before his honor, the police judge, paid his fine for his fun like a little man and went on his way rejoicing. He may congratulate himself that his lines, while he was drunk, were cast in such a pleasant place as Wichita as there are but a few other places where that $500 bank roll would have been heard from. The integrity of our police force has never been seriously questioned." Wyatt's stint as Wichita deputy came to a sudden end on April 2, 1876, when Earp took too active an interest in the city marshal's election. According to news accounts, former marshal Bill Smith accused Wyatt of wanting to use his office to help hire his brothers as lawmen. Wyatt responded by getting into a fistfight with Smith and beating him. Meagher hinted that he had no intentions of aiding the Earps, which angered Wyatt. Meagher was forced to fire and arrest Earp for disturbing the peace, the end of a tour of duty which the papers called otherwise "unexceptionable." When Meagher won the election, the city council was split evenly on re-hiring Earp. With the cattle trade diminishing in Wichita, however, Earp moved on to the next booming cow-town, Dodge City, Kansas. Bat Masterson and Wyatt Earp in Dodge City, 1876. The scroll on Earp's chest is a cloth pin-on badge. Dodge City, Kansas became a major terminal for cattle driven from Texas along the Chisholm Trail from Texas after 1875. Earp was appointed assistant marshal in Dodge City, under Marshal Lawrence E. "Larry" Deger, May 17, 1876. There is some indication that Earp traveled to Deadwood in the Dakota Territory, during the winter of 1876-1877. He was not on the police force in Dodge City in the later part of 1877, although he is listed as being on the force in the spring. His presence in Dodge as a private citizen is substantiated by a July notice in the newspaper that he was fined one dollar for slapping a muscular prostitute named Frankie Bell, who (according to the papers) "…heaped epithets upon the unoffending head of Mr. Earp to such an extent as to provide a slap from the ex-officer…." Bell spent the night in jail and was fined costs of $20.00, while Earp's fine was the legal minimum. In October 1877, Earp left Dodge City for a short while to gamble throughout Texas. He stopped at Fort Griffin, Texas, where (according to Wyatt's recollection in the Stuart Lake biography) he met a young, card-playing dentist known as Doc Holliday. Earp returned to Dodge City in 1878 to become the assistant city marshal under Charlie Bassett. Holliday moved to Dodge City in June 1878 and saved Earp's life in August. While Earp was trying to break up a bar-room brawl, a cowboy drew a gun and pointed it at Earp's back. Holliday yelled, "Look out, Wyatt," then drew his gun, scaring the cowboy enough to make him back off. In the summer of 1878, Texas cowboy George Hoy, after an altercation with Wyatt, returned with friends and fired into the Comique variety hall, outside of which stood police officers Wyatt Earp and Jim Masterson. Inside the theater, a great number of .45 bullets penetrated the plank building easily, sending Doc Holliday, Bat Masterson, comedian Eddie Foy and many others instantly to the floor. Masterson, Foy, and the National Police Gazette later all gave accounts of the damage to the building and danger to those inside. No one was hurt (Foy noted that a new suit, which remained hanging up, had three bullet holes in it). The lawmen, both inside and outside the building, returned fire, and Hoy was shot from his horse as he rode away, with a severe wound to the arm. A month later, on August 21, he died of the wound. Whose bullet struck Hoy is unknown, but Earp claimed the shot. James Masterson, a gunman in his own right and the lesser known brother to Bat Masterson, was standing with Earp during the shootout, and many believed it was actually his shot that downed Hoy. Earp, many years later, claimed Hoy was attempting to assassinate him at the behest of Robert Wright, with whom he claimed an ongoing feud. Earp said the feud between himself and Wright started when Earp arrested Bob Rachals, a prominent trail leader who had shot a German fiddler. According to Earp, Wright tried to block the arrest because Rachals was one of the largest financial contributors to the Dodge City economy. Earp claimed that Wright then hired Clay Allison to kill Earp, but Allison backed down when confronted by Earp and Bat Masterson. Allison was also a moderately famous character of the Old West, but current research cannot confirm the tale of Earp and Masterson confronting him. Bat Masterson was out of town when Allison tried to "tree" (scare) Dodge City on September 19, 1878, and witnesses, cowboy Charles Siringo and Chalkley M. Beeson (proprietor of the famous Long Branch Saloon), left written recollections of the incident. They said it was actually Texas cattleman Richard McNulty who faced down Allison. Siringo said Earp was nowhere to be found while Beeson said Earp was working behind the lines. A distant cousin of Earp's has speculated it may be that the incident both Siringo and Beeson remembered happened at another time, but no account of another incident has yet come to light. Celia Anne "Mattie" Blaylock, a former prostitute, arrived in Dodge City with Earp. She became Earp's companion until 1882. Earp resigned from the Dodge City police force on September 9, 1878 and headed to Las Vegas, New Mexico, with Blaylock. Deputy Earp was known for pistol-whipping armed cowboys before they could dispute town ordinances against carrying of firearms. It is not known what kind of pistol Wyatt carried. The existence of Earp’s long-barreled pistol, for many years doubted, may have been a reality. The story of the Buntline begins with the murder of actress Dora Hand on October 4, 1878. Hand was shot by a gentleman attempting to kill Dodge City Mayor James H. "Dog" Kelly after the two had had a series of heated arguments. Dora was a guest in Kelly’s house and sleeping in his bed at the time while Kelly and wife were out of town. Dora was a celebrity in 1878, and her murder became a national story. Earp was in the posse which brought down the murderer. The story of the capture was reported in newspapers as far as New York and California. 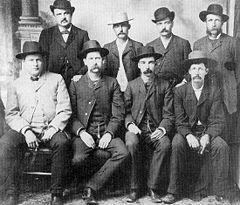 Five men were dispatched as a posse to capture the assassin: Wyatt Earp, Bat Masterson, a very young Bill Tilghman, Charlie Bassett and William Duffy. Earp shot the man’s horse, and Masterson wounded the assassin, James "Spike" Kenedy, son of Texas cattleman Miflin Kenedy. The Dodge City Times called them "as intrepid a posse as ever pulled a trigger." Spike Kenedy would get off, thanks to the influence (and wealth) of his very prominent father. It is very likely that Dora’s murder and the tracking down of her assassin were the events which caused Ned Buntline to bestow the gift of the "Buntline Specials." Earp’s biography claimed the Specials were given to "famous lawmen" Wyatt Earp, Bat Masterson, Bill Tilghman, Charlie Bassett and Neal Brown by author Ned Buntline in return for “local color” for his western yarns. The historical problem is that neither Tilghman nor Brown was a lawman then. Further, Buntline wrote only four western yarns, all about Buffalo Bill. So, if Buntline got any “local color," he never used it. Lake spent much effort trying to track down the Buntline Special through the Colt company and Masterson and contacts in Alaska. It was a Colt Single Action Army model with a 12-inch (30 cm) barrel, standard sights, and wooden grips into which the name “Ned” was ornately carved. Of those guns awarded, Earp was the only one who kept his the original length that it had when it was awarded to him. Masterson and the others cut the barrel down for easier concealment. Wyatt and his older brothers James (Jim) and Virgil moved to silver-mining boomtown Tombstone, in the Arizona Territory, in December 1879. Wyatt brought a wagon that he planned to convert into a stagecoach, but on arrival he found two established stage lines already running. Jim worked as a barkeep. Virgil was appointed deputy U.S. marshal, just prior to arriving in Tombstone. (The U.S. marshal for the Arizona Territory, C.P. Dake, was based in Prescott 280 miles [about 450 km] away, so the deputy U.S. marshal job in Tombstone represented federal authority in the southwest area of the territory.) In Tombstone, the Earps staked mining claims. Wyatt also went to work for Wells Fargo, riding shotgun for their stagecoaches when they held strongboxes. Eventually, in the summer of 1880, younger brothers Morgan and Warren Earp moved to Tombstone as well, and in September, Doc Holliday arrived. On July 25, 1880, U.S. Deputy Marshal Virgil Earp accused Frank McLaury, a "Cowboy," (often capitalized in papers as a local term for a cattle-dealer that often was synonymous with rustler) of taking part in the stealing of six Army mules from Camp Rucker. This was a federal matter because the animals were federal property. The McLaurys were caught changing the "U.S." brand to "D.8." by the Army representative and Earp. However, to avoid a fight, the posse withdrew on the understanding that the mules would be returned. They were not. In response, the Army's representative published an account in the papers, damaging Frank McLaury's reputation. This incident marked the beginning of animosity between the McLaurys and the Earps. About the same time, Wyatt was appointed deputy sheriff for the southern part of Pima County, which was at that time the surrounding country containing Tombstone. Wyatt served in the office only three months. On October 28, 1880, as Tombstone town-marshal (police chief) Fred White was trying to break up a group of late revelers shooting at the moon on Allen Street in Tombstone, he was shot in the groin as he attempted to confiscate the pistol of "Curly Bill" William Brocius, who was apparently one of the group. The pistol was later found to be loaded except for one expended cartridge. Morgan and Wyatt Earp, along with Wells Fargo agent Fred Dodge, came to White's aid. Wyatt hit Brocius over the head with a pistol borrowed from Dodge and disarmed Brocius, arresting him on a deadly weapon assault charge (Virgil Earp was not present at White's shooting or Brocius' arrest). Wyatt and a deputy took Brocius in a wagon the next day to Tucson to stand trial, possibly saving him from being lynched (Brocius waived the preliminary hearing to get out of town faster, probably believing the same). White, age 31, died of his wound two days after his shooting, changing the charge to murder. On December 27, 1880, Wyatt testified in Tucson court regarding the Brocius-White shooting. Partly because of Earp’s testimony (and also a statement given by White before he died) that the shooting had not been intentional, the judge ruled the shooting accidental and set Brocius free. Brocius, however, remained a friend of the McLaurys and an enemy of the Earps. 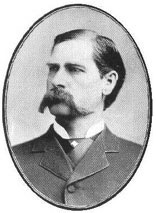 Wyatt Earp resigned as deputy sheriff of Pima County on November 9, 1880, (just 12 days after the White shooting), because of an election vote-counting dispute. Wyatt favored the Republican challenger Bob Paul, rather than his current boss, Pima Sheriff Charlie Shibell. Democrat Shibell was re-elected after what was later found to be ballot-box stuffing by area cowboys. He appointed Democrat Johnny Behan as the new deputy undersheriff for the south Pima area to replace Earp. Several months later, when the southern portion of Pima County was split off into Cochise County, both Earp and Behan were applicants to be appointed to fill the new position. Wyatt, as former undersheriff and a Republican in the same party as Territorial Governor Fremont, assumed he had a good chance at appointment, but he also knew current undersheriff Behan had political influence in Prescott. Earp later testified that he made a deal with Behan that if he (Earp) withdrew his application, Behan would name Earp as undersheriff if he won. Behan testified there was never any such deal, but that he had indeed promised Wyatt the job if Behan won. However, after Behan gained appointment as sheriff of the new Cochise County in February 1881, he chose Harry Woods (a prominent Democrat) to be the undersheriff. This left Wyatt Earp without a job in Tombstone, even after Wyatt's friend Bob Paul won the disputed Pima sheriff election. However, about this time all the Earps were beginning to make some money on their mining claims in the Tombstone area. Wyatt had one of his branded horses stolen in late 1879, shortly after he arrived in Tombstone. More than a year later, after the election dispute court hearings began (probably in December 1880 or early January 1881), Wyatt heard that the horse was in the possession of Ike Clanton and Billy Clanton, who had a ranch near Charleston. Earp (a private citizen) and Holliday rode to Charleston (passing Deputy Sheriff Behan in a wagon with two other men, who were heading to serve an election-hearing subpoena on Ike Clanton) and recovered the horse. Wyatt testified later in disgust at the Spicer hearing that Billy Clanton had given up the horse even before being presented with ownership papers, showing that he knew it was stolen. The incident, while nonviolent, damaged the Clantons' reputations and convinced the Earps that the Clantons were horse thieves. This incident also began the Earps' public difficulties with Behan (at least according to Behan), who later testified that Earp and Holliday had put a scare into the Clantons by telling them that Behan was on his way with an armed posse to arrest them for horse theft. Such a mission would have had the effect of turning the Clantons against Behan, who badly needed the Clantons' political support since they were not afraid of him (according to Behan's testimony, Ike swore at the time that he would never stand for being arrested by Behan). Behan stated the incident was the reason he did not name Earp as his undersheriff. If Behan had served his subpoena on Ike Clanton, Clanton never responded to it, and Behan did not try to enforce the summons. In January 1881, Wyatt Earp became part owner, with Lou Rickabaugh and others, in the gambling concession at the Oriental Saloon. Shortly thereafter, in Earp's story, John Tyler was hired by a rival gambling operator to cause trouble at the Oriental to keep patrons away. After losing a bet, Tyler became belligerent, and Earp took him by the ear and threw him out of the saloon. Tensions between the Earps and both the Clantons and McLaurys increased through 1881. In March 1881, three cowboys attempted an unsuccessful stagecoach holdup near Benson, during which the driver and passenger were murdered in the gunfire. There were rumors that Doc Holliday (who was a known friend of one of the suspects) had been involved, though the formal accusation of Doc's involvement was started by Doc's drunken companion Big Nose Kate after a quarrel, and she later recanted after she sobered. Wyatt later testified that in order to help clear Doc's name and to help himself win the next sheriff's election, he went to Ike Clanton and Frank McLaury and offered to give him all the reward money for information leading to capture of robbers. According to Earp, both Frank McLaury and Ike Clanton agreed to provide information for the capture, knowing that if word got out to the cowboys that he had double-crossed them, that the lives of Frank and Ike would be worth little. Later, after all three cowboy suspects in the stage robbery were killed in unrelated violent incidents, and there was no reward to be made from them, Clanton accused Earp of leaking their deal to either his brother Morgan, or to Holliday. Clanton especially blamed Holliday. Meanwhile, tensions between the Earps and the McLaurys increased with the holdup of yet another stage in the Tombstone area (September 8), this one a passenger stage in the Sandy Bob line, bound for nearby Bisbee. The masked robbers shook down the passengers (the stage had no strongbox) and in the process were recognized from their voices and language as Pete Spence (an alias) and Frank Stilwell, a business partner of Spence who was also at the time a deputy of Sheriff Behan's. Wyatt and Virgil Earp rode in the posse attempting to track the Bisbee stage robbers, and during the tracking, Wyatt discovered the unusual print of a custom repaired boot heel. Checking a shoe repair shop in Bisbee known to provide widened bootheels led to identification of Stilwell as a recent customer, and a check of a Bisbee corral (Stilwell and Spence were business partners with interests in Bisbee) turned up both Spence and Stilwell. Stilwell was found with a new set of wide custom boot heels matching the prints of the robber. Stilwell and Spence were arrested by the sheriff's posse under sheriff's deputies Breakenridge and Nagel for the stage robbery, and later by U.S. deputy marshal Virgil Earp on the federal offense of mail robbery. However, despite the evidence, both Stilwell and Spence were released on bail and the charges never materialized into a solid case. A month later (October 8) came yet another stage robbery, this one near Contention city. Though five robbers were seen involved, again Spence and Stilwell were arrested October 13, and taken by Virgil and Wyatt Earp to jail and arraignment in Tucson. The newspapers reported that they had been arrested for the Contention robbery, but they had actually been re-arrested by Virgil for the (new) federal charge of interfering with a mail carrier for the earlier Bisbee robbery. This final incident may have caused a misunderstanding among Spence and Stilwell's friends, making them look like scapegoats. Occurring less than two weeks before the O.K. Corral shootout, it had the immediate effect of causing Frank McLaury, who was a friend of Spence and Stilwell, to confront Morgan Earp, while Wyatt and Virgil were still out of town for the Spence and Stilwell hearing. Frank reportedly told Morgan that the McLaurys would kill the Earps if they tried to arrest either man again, or the McLaurys. Clanton warned that he and his group would be ready to scuffle with Holliday and the Earps on night before the fabled O.K. Corral shootout. Virgil Earp requested that Wyatt Earp and Doc Holliday support him and Morgan Earp in preparation for the gunfight. They were both deputized for the occasion. Wyatt spoke of his brothers Virgil and Morgan as the "marshals" while he acted as "deputy." Wyatt's testimony at the Spicer indictment hearing was in writing (as was permitted by law, which allowed statements without cross-examination at pre-trial hearings) and Wyatt therefore was not cross-examined. Wyatt testified that he and Billy Clanton began the fight after Clanton and Frank McLaury drew their pistols, and Wyatt shot Frank in the stomach while Billy shot at Wyatt and missed. The unarmed Ike Clanton escaped the fight unwounded, as did the unarmed Billy Claiborne. Wyatt was not hit in the fight, while Doc Holliday, Virgil Earp, and Morgan Earp were wounded. Billy Clanton, Tom McLaury, and Frank McLaury were killed. Billy Clanton and Frank McLaury were openly armed with pistols in gunbelts and holsters, and used them to wound Virgil, Morgan and Doc Holliday. Whether Tom McLaury was armed during the fight is unknown, but preponderance of evidence is that he was not armed. In his testimony, Wyatt stated that he believed Tom McLaury was armed with a pistol, but his language contains equivocation. The same is true of Virgil Earp's testimony. Both Earp brothers left themselves room for contradiction on this point, but neither one was equivocal about the fact that Tom had been killed by Holliday with a shotgun. The gunfight occurred on the morning of October 26, 1881, on Fremont Street beside the home of W.A. Harwood, which was located directly in back of the O.K. Corral. On October 30, Ike Clanton filed murder charges against the Earps and Holliday. Wyatt and Holliday were arrested and brought before Justice of the Peace Wells Spicer, while Morgan and Virgil were still recovering. Bail was set at $10,000 apiece. The hearing to determine if there was enough evidence to go to trial started November 1. The first witnesses were Billy Allen and Behan. Allen testified that Holliday fired the first shot and that the second one also came from the Earp party, while Billy Clanton had his hands in the air. Then Behan testified that he heard Billy Clanton say, "Don't shoot me. I don't want to fight." He also testified that Tom McLaury threw open his coat to show that he was not armed and that the first two shots were fired by the Earp party. Behan also said that he thought the next three shots also came from the Earp party. Behan's views turned public opinion against the Earps. His testimony portrayed a far different gunfight than had been first reported in the local papers. Because of Allen's and Behan's testimony and the testimony of several other prosecution witnesses, Wyatt and Holliday's lawyers were presented with a writ of habeas corpus from the probate court and appeared before Judge John Henry Lucas. After arguments were given, the judge ordered them to be put in jail. By the time Ike Clanton took the stand on November 9, the prosecution had built an impressive case. Several prosecution witnesses had testified that Tom McLaury was unarmed, that Billy Clanton had his hands in the air and that neither of the McLaurys were troublemakers. They portrayed Ike Clanton and Tom McLaury as being unjustly bullied and beaten by the vengeful Earps on the day of the gunfight. The Earps and Holliday looked certain to be convicted until Ike Clanton inadvertently came to their rescue. Clanton's testimony repeated the story of abuse that he had suffered at the hands of the Earps and Holliday the night before the gunfight. He reiterated that Holliday and Morgan Earp had fired the first two shots and that the next several shots also came from the Earp party. Then under cross-examination, Clanton told a story of the lead-up to the gunfight which did not make sense. It told of the Benson stage robbery conducted to cover up stolen money that was actually not missing. Ike also claimed that Doc Holliday and Morgan, Wyatt, and Virgil Earp had all separately confessed to him their role in either the pre-robbery of Benson stage money, the Benson stage holdup, or else the cover-up of the robbery by allowing the robbers' escape. By the time Ike finished his testimony, the entire prosecution case had become suspect. The first witness for the defense was Wyatt Earp. He read a prepared statement detailing the Earps' previous troubles with the Clantons and McLaurys, and explaining why they were going to disarm the cowboys, and claiming that they fired on them in self defense. Because Arizona's territorial laws allowed a defendant in a preliminary hearing to make a statement in his behalf without facing cross-examination, the prosecution was not allowed to question Earp. After the defense had established doubts about the prosecution's case, the judge allowed Holliday and Earp to return to their homes in time for Thanksgiving. Justice Spicer eventually ruled that the evidence indicated that the Earps and Holliday acted within the law (with Holliday and Wyatt effectively having been deputized temporarily by Virgil), and he invited the Cochise County grand jury to reevaluate his decision. Spicer did not condone all of the Earps' actions and he criticized Virgil Earp's choice of deputies Wyatt and Holliday, but he concluded that no laws were broken. He made special point of the fact that Ike Clanton, known to be unarmed, had been allowed to pass through the center of the fight without being shot. Even though the Earps and Holliday were free, their reputation was tarnished. Supporters of the cowboys (a very small minority) in Tombstone looked upon the Earps as robbers and murderers. However, on December 16, the grand jury decided not to reverse Spicer's decision. In December, Clanton went before the Justice of the Peace J. B. Smith in Contention and again filed charges against the Earps and Holliday for the murder of Billy Clanton and the McLaurys. A large posse escorted the Earps to Contention, fearing that the cowboys would try to ambush the Earps on the unprotected roadway. The charges were dismissed by Judge Lucas because of Smith's judicial ineptness. The prosecution immediately filed a new warrant for murder charges, issued by Justice Smith, but Judge Lucas quickly dismissed it, writing that new evidence would have to be submitted before a second hearing would be called. Because the November hearing before Spicer was not a trial, Clanton had the right to continue pushing for prosecution, but the prosecution would have to come up with new evidence of murder before the case could be considered. On December 28, while walking between saloons on Allen Street in Tombstone, Virgil was attacked by shotgun fire. His left arm and shoulder took the brunt of the damage. Ike Clanton's hat was found in the back of the building across Allen street, from where the shots were fired. Wyatt wired U.S. Marshal Crawley Dake asking to be appointed deputy U.S. Marshal with authority to select his own deputies. Dake responded by granting the request. In mid-January, Wyatt sold his gambling concessions at the Oriental when Rickabaugh sold the saloon to Milt Joyce, an Earp adversary. On February 2, 1882, Wyatt and Virgil, tired of the criticism leveled against them, submitted their resignations to Dake, who refused to accept them. On the same day, Wyatt sent a message to Ike Clanton that said he wanted to reconcile their differences. Clanton refused. Also on the same day, Clanton was acquitted of the charges against him in the shooting of Virgil Earp, when the defense brought in seven witnesses that testified that Clanton was in Charleston at the time of the shooting. After attending a theater show on March 18, Morgan Earp was assassinated by gunmen firing from a dark alley, through the door window into the lighted pool hall. Morgan was hit in the lower back while a second shot hit the wall just over Wyatt's head. The assassins escaped in the dark, and Morgan died less than an hour later. Based on the testimony of Pete Spence's wife, Marietta, at the coroner’s inquest on the killing of Morgan, the coroner's jury concluded that Spence, Stilwell, Frederick Bode, and Florentino "Indian Charlie" Cruz were the prime suspects in the assassination of Morgan Earp. Spence turned himself in so that he would be protected in Behan's jail. On Sunday, March 19, the day after Morgan's murder, Wyatt, his brother James, and a group of friends took Morgan's body to the railhead in Benson. They put Morgan's body on the train with James, to accompany it to the family home in Colton, California. There, Morgan's wife waited to bury him. The next day, it was Virgil and his wife Allie's turn to be escorted safely out of Tombstone. Wyatt had gotten word that trains leaving from Benson were being watched in Tucson, and getting the still invalid Virgil through Tucson to safety would be more difficult. Wyatt, Warren Earp, Holliday, Turkey Creek Jack Johnson, and Sherman McMasters took Virgil and Allie in a wagon to the train in Benson, leaving their own horses in Contention City and boarding the train with Virgil. As the train pulled away from the Tucson station in the dark, gunfire was heard. Frank Stilwell's body was found on the tracks the next morning. What Stilwell was doing on the tracks near the Earps' train has never been explained. Ike Clanton made his case worse by giving a newspaper interview claiming that he and Stilwell had been in Tucson for Stilwell's legal problems and heard that the Earps were coming in on a train to kill Stilwell. According to Clanton, Stilwell then disappeared from the hotel and was found later, blocks away, on the tracks. Wyatt, many years later, quoted in the Flood biography, said that he and his party had seen Clanton and Stilwell on the tracks with weapons, and he had shot Stilwell. After killing Stilwell in Tucson and sending their train on its way to California with Virgil, the Earp party was afoot. They hopped a freight train back to Benson and hired a wagon back to Contention, riding back into Tombstone by the middle of the next day (March 21). They were now wanted men, because once Stilwell's killing had been connected to the Earp party on the train, warrants had been issued for five of the Earp party. Ignoring Johnny Behan and now joined by Texas Jack Vermillion, the Earp posse rode out of town the same evening. On March 22, the Earps rode to the woodcamp of Pete Spence at South Pass in the Dragoon Mountains, looking for Spence. They knew of the Morgan Earp inquest testimony. Spence was in jail, but at the woodcamp, the Earp posse found Florentino "Indian Charlie" Cruz. Earp said to his biographer Lake that he got Cruz to confess to being the lookout, while Stilwell, Hank Swilling, Curly Bill and Ringo killed Morgan. After the "confession," Wyatt and the others shot and killed Cruz. Two days later, in Iron Springs, Arizona, the Earp party, seeking a rendezvous with a messenger for them, stumbled upon a group of cowboys led by "Curley Bill" William Brocious. In Wyatt's account, he had jumped from his horse to fight, when he noticed the rest of his posse retreating, leaving him alone. Curley Bill was surprised in the act of cooking dinner at the edge of a spring, and he and Wyatt traded shotgun blasts. Curley Bill was hit in the chest by Wyatt's shotgun fire and died. Wyatt survived several near misses from Curley Bill's companions before he could remount his horse and was not hit. During the fight, another cowboy named Johnny Barnes received fatal wounds. The Earp party survived unharmed and spent the next two weeks riding though the rough country near Tombstone. Ultimately, when it became clear to the Earps that Behan's posse would not fight them, nor could they return to town, they decided to ride out of the territory for good. In the middle of April 1882, Wyatt Earp left the Arizona Territory. After the killing of Curley Bill, the Earps left Arizona and headed to Colorado. In a stopover in Albuquerque, New Mexico, Wyatt and Holliday had a falling out but remained on fairly good terms. The group split up after that, with Holliday heading to Pueblo and then Denver. The Earps and Texas Jack set up camp on the outskirts of Gunnison, Colorado, where they remained quiet at first, rarely going into town for supplies. Eventually, Wyatt took over a faro game at a local saloon. Slowly all of the Earp assets in Tombstone were sold to pay for taxes, and the stake the family had amassed eroded. 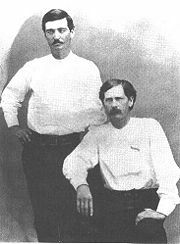 Wyatt and Warren joined Virgil in San Francisco in late 1882. While there, Wyatt rekindled a romance with Josephine Sarah Marcus, Behan's one-time fiancée. His common-law wife, Mattie, waited for him in Colton but eventually realized Wyatt was not coming back (Wyatt had left Mattie the house when he left Tombstone). Earp left San Francisco with Josie in 1883, and she became his companion for the next 46 years (no marriage certificate has been found). Earp and Marcus returned to Gunnison where they settled down, and Earp continued to run a faro bank. In 1883, Earp returned, along with Bat Masterson, to Dodge City to help a friend deal with a corrupt mayor. What became known as the Dodge City War was started when the Mayor of Dodge City tried to run Luke Short first out of business and then out of town. Short appealed to Masterson who contacted Earp. While Short was discussing the matter with Governor George Washington Glick in Kansas City, Earp showed up with Johnny Millsap, Shotgun Collins, Texas Jack Vermillion, and Johnny Green. They marched up Front Street into Short's saloon where they were sworn in as deputies by constable "Prairie Dog" Dave Marrow. The town council offered a compromise to allow Short to return for ten days to get his affairs in order, but Earp refused compromise. When Short returned, there was no force ready to turn him away. Short's Saloon reopened, and the Dodge City War ended without a shot being fired. Earp spent the next decade running saloons and gambling concessions and investing in mines in Colorado and Idaho, with stops in various boom towns. Earp traveled to El Paso, Texas at one point and also opened a saloon in Aspen, Colorado. In 1886, Earp and Josie moved to San Diego and stayed there about four years. Earp ran several gambling houses in town and speculated in San Diego's real estate boom. He also judged prize fights and raced horses. On July 3, 1888, Mattie Earp committed suicide in Pinal, Arizona Territory, by taking an overdose of laudanum, a tincture of opium used as medicine. The Earps moved back to San Francisco during the 1890s so Josie could be closer to her family and Wyatt closer to his new job, managing a horse stable in Santa Rosa. During the summer of 1896, Earp wrote his memoirs with the help of a ghost writer (Flood). On December 3, 1896, Earp was the referee for the boxing match to determine the heavyweight championship of the world. During the fight Bob Fitzsimmons, clearly in control, landed a low blow against Tom Sharkey. Earp awarded the victory to Sharkey and was accused of committing fraud. Fitzsimmons had an injunction put on the prize money until the courts could determine who the rightful winner was. The judge in the case decided that because fighting, and therefore prize fighting, was illegal in San Francisco, that the courts would not determine who the real winner was. The decision provided no vindication for Earp. His past affairs in Tombstone came to light once again, as the public attempted to scrutinized and evaluate his character. In the fall of 1897, Earp and Josie chased another gold rush to Alaska. Earp ran several saloons and gambling concessions in Nome. While living in Alaska, Earp possibly met and became friends with Jack London. This is questionable as London took part in the Klondike Gold Rush of 1897. While the Nome Alaska Gold Rush was about eight years later when London was elsewhere. Controversy continued to follow Earp, and he was arrested several times for different minor offenses. Earp eventually moved to Hollywood, where he met several famous and soon to be famous actors on the sets of various movies. On the set of one movie, he met a young extra and prop man who would eventually become John Wayne. Wayne later told Hugh O'Brian that he based his image of the Western lawman on his conversations with Earp. And one of Earp's friends in Hollywood was William S. Hart, a well-known cowboy star of his time. In the early 1920s, Earp served as deputy sheriff in a mostly ceremonial position in San Bernardino County, California. Wyatt Earp died at home in the Earps' small apartment at 4004 W 17th Street, in Los Angeles, of chronic cystitis (some sources cite prostate cancer) on January 13, 1929, at the age of 80. Western actors William S. Hart and Tom Mix were pallbearers at his funeral. His wife Josie was too grief-stricken to attend. Josie had Wyatt's body cremated and buried Wyatt's ashes in the Marcus family plot at the Hills of Eternity, a Jewish cemetery (Josie was Jewish) in Colma, California. When she died in 1944, Josie's ashes were buried next to Wyatt's. The original gravemarker was stolen in 1957 but has since been replaced by a new standing stone. During his lifetime, Earp strove to be a successful man. He never felt that any of his killings as a lawman were unwarranted. The men he had executed, he thought, had expedited such action because they refused to be pacified by other means. For the rest of his life Earp would strive for success and, even more importantly, respect. He hoped to gain the confidence and trustworthiness of his peers and was disheartened whenever his past was unearthed anew to attack his character, which happened with some regularity. He became a target of the press and was unable to escape lurid retellings of his past in Tombstone. Even former friends attempted to cash in on the mania. Wyatt eventually realized that his attempts to live a less infamous life were futile, and decided, with the prodding from his wife and others, to write an autobiography. He allowed John H. Flood, Jr. to write out his memories as he retold them, though Flood proved unsuitable for the task. The manuscript was so poorly written that it never saw publication. Stuart N. Lake asked Wyatt to allow him to retell his life. Wyatt was hesitant and suspicious, but agreed. He worked with Lake for a short time before his abrupt death and Lake's biography portrayed him in mythical terms. Earp would likely have approved, yet the book renders Earp's story all the more cloudy and debatable. Earp was a man with solid values who stood behind his beliefs. He often acted on his own impulses of right and wrong and, some argue, was justified in doing so. The environment he lived in was chaotic and based on survival of the fittest. It was important to Earp to gain a positive reputation in the West, but he never fully achieved this goal during his lifetime. Frontier Marshal (1934) – The first film adaptation of Stuart N. Lake's novel about Earp. Earp's character, portrayed by George O'Brien, is renamed "Michael Earp." Frontier Marshal (1939) – Stars Randolph Scott. Tombstone, the Town Too Tough to Die (1942) – Stars Richard Dix. My Darling Clementine (1946) – Stars Henry Fonda and directed by John Ford. Wichita (movie) (1955) – Stars Joel McCrea. The Life and Legend of Wyatt Earp (1955–1961) – television series starring Hugh O'Brian as Wyatt Earp. Gunfight at the O.K. Corral (1957) – Stars Burt Lancaster. Hour of the Gun (1967) – Stars James Garner. Doc (movie) (1971) – Tells the story of the Gunfight at the O.K. Corral from Doc Holliday's point of view. Tombstone (1993) – Stars Kurt Russell. Wyatt Earp: Return to Tombstone (1994) – Film combines colorized footage of The Life and Legend of Wyatt Earp with new scenes filmed in Tombstone. Wyatt Earp (1994) – Stars Kevin Costner. Law and Order (1932) – Film starring Walter Huston as Frame Johnson, a character inspired by Wyatt Earp. Dodge City (1939) – Film starring Errol Flynn as Wade Hatton, inspired by Wyatt Earp. Winchester '73 (1950) – Film in which James Stewart wins a Winchester rifle that is stolen. Will Geer portrays Wyatt Earp. Gun Belt (1953) – Film where outlaw Billy Ringo tries to go straight. Masterson of Kansas (1954) – Film about Bat Masterson. Badman's Country (1958) – Pat Garrett catches up to Butch Cassidy's gang and calls in Wyatt Earp. Alias Jesse James (1959) – Comedy film starring Bob Hope. Warlock (1959) – Western film starring Richard Widmark, Henry Fonda and Anthony Quinn. Fonda and Quinn's characters are heavily based on Earp and Doc Holliday. The Secret World of Eddie Hodges (1960) – Musical television movie. Cheyenne Autumn (1964) – a John Ford western film with Earp as a side character portrayed by James Stewart. The Outlaws Is Coming (1965) – The final Three Stooges feature film. Sfida a Rio Bravo (1965) – Film starring Guy Madison as Wyatt Earp. The Gunfighters (1966 Doctor Who episode) - The TARDIS materializes in Tombstone, where the Doctor, Dodo, and Steven quickly become embroiled in the events leading up to the famous gunfight. Spectre of the Gun (1968 Star Trek episode) – The Enterprise officers are forced to play out the role of the Clanton gang in a re-enactment of the Tombstone incident. In this version, Earp (Ron Soble) and his men were portrayed as criminals. Star Trek series cast member DeForest Kelly had earlier portrayed Morgan Earp in the 1957 film, Gunfight at the O.K. Corral. I Married Wyatt Earp (1983) – Television docudrama based on the (supposed) memoirs of Josephine Marcus Earp, played by Marie Osmond. Sunset (1988) – Tom Mix (Bruce Willis) and Wyatt Earp (James Garner) team up to solve a murder at the 1929 Academy Awards. The Gambler Returns: The Luck of the Draw (1991) – Television movie starring Kenny Rogers as The Gambler. Hugh O'Brian cameos as Wyatt Earp. Deadwood (2006) – Wyatt and his brother Morgan appear in two episodes during season three. In the long narrative poem Wyatt Earp in Dallas, 1963 by Steve McCabe, Earp received a prophecy from a prisoner who foretold the invention of television and the death of President Kennedy. Earp, motivated by this prophecy, time-traveled to Dallas to prevent JFK's assassination. The events of Earp's and Holliday's stay in Tombstone, including the OK Corral fight are depicted in many novels, including Who Rides With Wyatt by Will Henry (1955), Bloody Season by Loren D. Estleman (1987), Wyatt Earp by Matt Braun, Trouble in Tombstone by Richard Wheeler, and Gunman's Rhapsody by Robert B. Parker (2001). ↑ Gary L. Roberts, "Wyatt Earp: The Search for Order on the Last Frontier," in With Bullets & Badges: Lawmen & Outlaws in the Old West, eds. Richard W. Etulain and Glenda Riley (Golden: Fulcrum Publishing, 1999. ISBN 0606216863), 2. ↑ 2.0 2.1 2.2 Roberts, 3. ↑ Third Generation, Wyatt Berry Stapp Earp. Rootsweb. Retrieved September 8, 2007. ↑ 4.0 4.1 4.2 4.3 4.4 Stuart N. Lake. Wyatt Earp: Frontier Marshal. (New York: Pocket Books, 1994). ↑ 6.0 6.1 Roberts, 6. ↑ 7.0 7.1 7.2 7.3 Roberts, 7. ↑ 8.0 8.1 8.2 Roberts, 8. ↑ 9.0 9.1 9.2 Roberts, 9. ↑ 11.0 11.1 Roberts, 12. ↑ 12.0 12.1 Roberts, 13. ↑ 14.0 14.1 14.2 14.3 14.4 Roberts, 16. ↑ 17.0 17.1 Roberts, 21. ↑ 18.0 18.1 18.2 Roberts, 22. ↑ 19.0 19.1 19.2 19.3 Roberts, 23. ↑ 20.0 20.1 Roberts, 24. 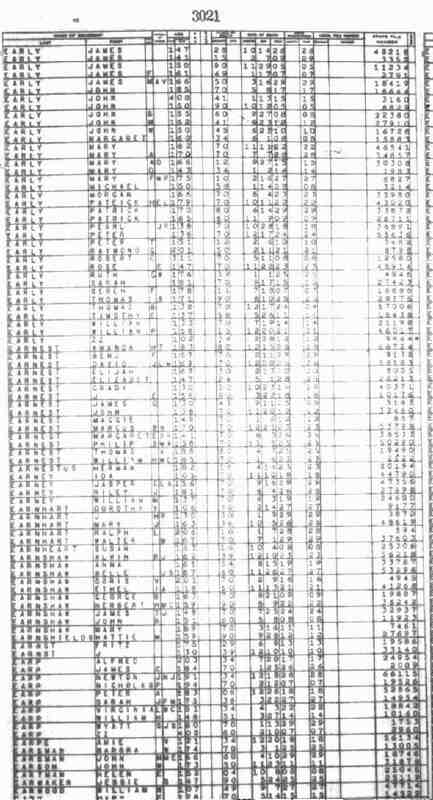 ↑ Image of register of deaths. Vitalsearch. Retrieved September 8, 2007. ↑ 22.0 22.1 22.2 Roberts, 25. Earp, Josephine Sarah Marcus. I Married Wyatt Earp: The Recollections of Josephine Sarah Marcus Earp, ed. Glenn W. Boyer. Tucson: University of Arizona Press, 1976. ISBN 0816505837. Rootsweb. Third Generation. Wyatt Berry Stapp Earp Retrieved September 8, 2007. Vitalsearch. Image of register of deaths. Image of register of deaths. Retrieved September 8, 2007. All links retrieved September 9, 2013. Wyatt Earp: Tombstonian by Tim Fattig tombstonetimes.com. Wyatt Earp Family History kansasheritage.org. John H. Flood, Jr., Chapter from Wyatt Earp 1926 autobiographical attempt. skyways.org. Celia Anne "Mattie" Blaylock Earp. findagrave.com. Wyatt Earp: Desert Lawman & Adventurer DesertUSA.com. Peter Brand, Wyatt Earp's Vendetta Posse. historynet.com. This page was last modified on 9 September 2013, at 18:29.